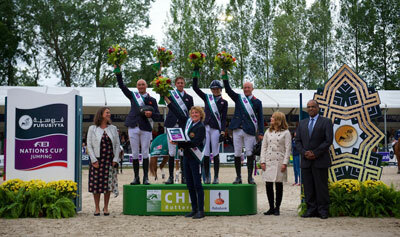 In a competition that was very definitely a game of two halves, the team of Ben Maher, Joe Clee, Jessica Mendoza and Michael Whitaker sensationally secured the third British win of the Furusiyya FEI Nations Cup™ Jumping 2015 Europe Division 1 League at Rotterdam in The Netherlands, today. Team Germany looked set to cruise home effortlessly after confidently taking the lead with four foot-perfect performances in the first round, but as can often happen in this most testing of competitions it all fell apart for them second time out. At the end of the day they had to settle for fourth place behind Sweden in third, while it was last year’s winners from France who filled runner-up spot. The Dutch, who despite being the reigning Furusiyya and World champions have never won the Nations Cup on home ground at Rotterdam, lined up fifth ahead of Switzerland in sixth, while Belgium and Brazil shared seventh place at the end of their relatively high-scoring day. And today’s result underpinned the strength of Di Lampard’s constantly developing British side, as Joe Clee and his super-consistent stallion Utamaro D’Ecaussines produced one of four double-clear rounds, while 19-year-old Jessica Mendoza announced her very definite arrival at the top end of the sport by following a single first-round error with a brilliant clear from her aptly-named mare, Spirit T.
It seemed as if it might turn into a German walk-in-the-park at the halfway stage when Christian Ahlmann (Codex One), Patrick Stuehlmeyer (Lacan), Ludger Beerbaum (Chiara) and Daniel Deusser (Cornet D’Amour) all breezed around on their first tour of the track set by Louis Konickx. However the French were stalking them with only a single time-fault as round two began, with the Dutch next in line carrying four faults ahead of the British with five and Sweden with six faults. The pathfinding Brazilian team began the second round with 11 faults, but dropped to joint-last place when, despite eye-catching second efforts from Felipe Amaral’s Premiere Carthoes and the Pedro Veniss’ graceful stallion Quabri de L’Isle, elimination for Yuri Mansur Guerios for a fall when Cornetto K ducked out at the open water meant they had to count 17 collected by Karina Johannpeter (Casper). The Belgians joined them at the bottom of the pile when Gilles Dunon was eliminated when his mare, Wasselina, threw in the towel at the oxer at fence three, so they had to add nine more faults to 18 collected first time out. And it wasn’t an entirely uneventful day for the Swiss either. Pius Schwizer was called up at the last moment when Claudia Gisler was whisked off to hospital after a fall in an earlier class. But she was given the all-clear later in the afternoon, and Schwizer meanwhile produced an impressive six-fault result from his inexperienced stand-in, the nine-year-old stallion Giovanni van Het Scheefkasteel. At the sharp end however, things changed suddenly and dramatically when Germany’s Ahlmann and Stuehlmeyer each left two fences on the floor. The door was now wide open for the French, and when Patrice Delaveau led the way with a second clear from Lacrimoso and Aymeric de Ponnat’s Armitages Boy followed his first-round four faults with a clean sheet it seemed they now had victory in their sights. But although the Dutch, lying third, slipped out of contention with nine to add despite a double-clear from Gerco Schroder and Glock’s Cognac Champblanc, the British also bubbled to the surface with fault-free runs from Maher, Clee and Mendoza. Michael Whitaker was under no pressure when last to go for his country because his result would make no difference – they would remain on their first-round five-fault tally no matter what happened. So the British watched closely as reigning European champion Roger Yves Bost entered the ring for France as third-line rider. If he could hold it together then he would ensure victory for his side, but his enigmatic stallion, Pegase du Murier who threw a similar tantrum in St Gallen two weeks ago, decided to go into reverse in front of the triple combination. And although he was eventually persuaded to continue, the pair collected 19 faults by the time they crossed the finish-line. So it all came down to the last Frenchman, Jerome Hurel, and his big-jumping stallion Quartz Rouge. They could afford a few time-penalties, but a fence down would force a jump-off with the British and any more would hand victory to them. And that was how it turned out when they hit the vertical following the open water and also collected two time faults to leave France on seven faults ahead of third-placed Sweden with 10, while Germany completed with 12 on the board. British Chef d’Equipe, Di Lampard, said afterwards, “we have started (the Furusiyya series) fantastic, with three wins and a second placed finish – it couldn’t have gone better! We hope to keep the momentum going for the rest of the series!” She was a keen Nations Cup competitor during her own very successful career and is really enjoying her team management role. “Nations Cup competitions were always my favourite, and now I get to ride eight rounds, so it’s fantastic for me!” she pointed out. And today was a watershed day in the career of Jessica Mendoza who last year steered Spirit T to team gold and individual bronze at the FEI European Championships for Juniors following team silver a year earlier in Spain. She only transferred full-time to horses last summer following a hugely successful career on ponies. “My Dad trains me and made sure I have horses that go a bit like ponies so the move from one to the other wouldn’t be too difficult. She (Spirit T) has such a big heart! She’s careful, not as scopy as some horses but she really tries! She was jumping amazing this year and so we got our chance. We went in a non-counting (for Furusiyya qualifying points) team first at St Gallen, and then on a counting team here” Mendoza explained. Her result certainly counted today and the British have now moved into fifth place on the Furusiyya FEI Nations Cup™ 2015 Europe Division 1 leaderboard going into the next leg at Falsterbo, Sweden in three weeks’ time. 2. France 7 faults: Lacrimoso 3 HDC (Patrice Delaveau) 0/0, Armitages Boy (Aymeric de Ponnat) 4/0 , Pegase du Murier (Roger Yves Bost) 0/19, Quartz Rouge (Jerome Hurel) 1/6. 3. Sweden 10 faults: H&M All In (Peder Fredricson) 1/0, Casello (Douglas Lindelow) 4/8, Bonzai H (Helena Persson) 1/4, Cantinero (Henrik von Eckermann) 4/0. 4. Germany 12 faults: Codex One (Christian Ahlmann) 0/8, Lacan 2 (Patrick Stuhlmeyer) 0/8, Chiara (Ludger Beerbaum) 0/4, Cornet d’Amour (Daniel Deusser) 0/0. 5. Netherlands 13 faults: SFN Zenith NOP (Jeroen Dubbeldam) 4/8, VDL Groep Verdi TN NOP (Maikel van der Vleuten) 0/5, VDL Groep Zidane (Leopold van Asten) 4/4, Glock’s Cognac Champblanc (Gerco Schroder) 0/0. 6. Switzerland 24 faults: Windsor XV (Niklaus Rutschi) 9/8, Giovanni van Het Scheefkasteel (Pius Schwizer) 5/1, Concetto Son (Steve Guerdat) 4/5, Castlefield Eclipse (Paul Estermann) 4/5. 7. Belgium 28 faults: Citizenguard Taalex (Constand van Paesschen) 21/9, Sea Coast Pebles Z (Gudrun Pateet) 5/0 , Wesselina (Gilles Dunon) 12/£lim, Ensor de Litrange LXll (Jos Lansink) 1/1. 7. Brazil 28 faults: Cornetto K (Yuri Mansur Guerios) 10/Elim, Premiere Carthoes BZ (Felipe Amaral) 4/0, Casper (Karina Johannpeter) 6/17, Quabri de l’Isle (Pedro Veniss) 1/0.